Tilapia have small mouths, so you must use tiny hooks and lures. Tilapia are fresh and brackish water fish whose popularity among anglers is starting to rival their popularity among chefs. Known for their mild tasting, white flesh, these natives of the Middle East and Africa have been introduced into numerous places outside of their natural range, including many U.S. states with warm waters. However, tilapia are largely herbivorous and rather shy, so catching them will test your skills as an angler. You can get tilapia to mouth the bait for one of two reasons: hunger or territoriality. While both options are effective, tilapia become so territorial during their spawning and fry-rearing season that they will attack virtually anything that passes over or through their spawning beds. Fortunately, tilapia spawn for extended periods, and they may not stop until the water temperatures drop below 60 degrees, which gives you plenty of time to drag lures near their beds. However, once the spawning has ended, the chances of catching tilapia with a line and reel drop precipitously. Tilapia prefer spawning in very shallow waters with abundant vegetation to provide cover from predators. It is relatively easy to spot their beds, which appear like craters covering the pond or river bottom. Be careful not to approach the beds too closely, since tilapia are nervous, easily spooked fish. Tilapia primarily feed on plant foods, so peas, corn and bread balls are the most effective baits for tempting hungry tilapia. To leverage their territorial instincts, use artificial lures that mimic small fish or invertebrates instead. Tilapia often bite fish-mimicking lures delicately, so it is important to use short lures that are more likely to result in a strong hook set. Some anglers have success by using a small piece of an earthworm on a very small hook. Tilapia are relatively small fish, so light tackle is appropriate. Use a 6- or 7-foot-long, lightweight pole with a spinning reel. String the reel with 4- to 8-pound test monofilament line and use No. 4 hooks. Be sure to bring a few very small floats for suspending your baits over spawning depressions, and some light split shot for when you want to keep a bait on the bottom of the spawning beds. While catch-and-release practices are recommended for many game fish species, such as bass and trout, it is best to keep, kill and cook all the tilapia that you catch. 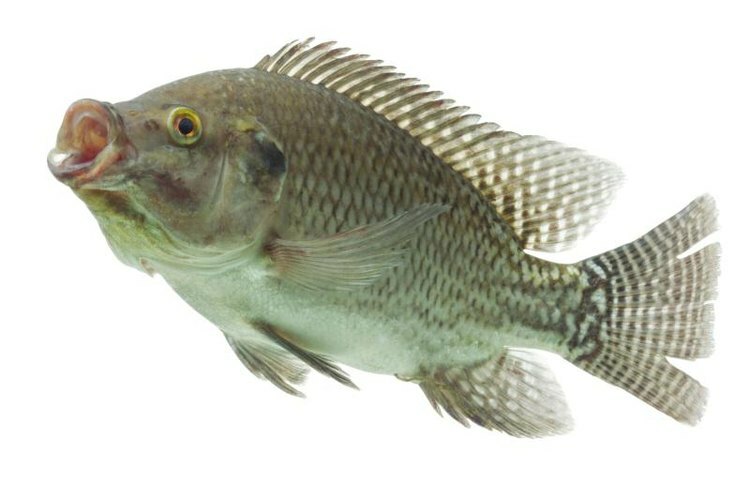 While tilapia have a number of good qualities, they are an invasive species outside their native range. Tilapia alter the vegetation composition of the ponds and rivers that they inhabit, which can harm local game fish populations. TheOnlineFisherman.com: What is the Best Bait and Method to Catch Tilapias?